On July 20th 1969, at 8:18pm, Apollo 11 landed on the moon. Astronauts Neil Armstrong and Buzz Aldrin, supported by Michael Collins, became the first people to walk on the surface of a celestial body beyond Earth. It was only 1903 when the Wright Brothers built what is generally accepted as the world’s first aeroplane. By 1969, people were walking on the moon. Yet the speed of aerospace development is perhaps not so shocking when one remembers that many of the ideas for flight and high-speed propulsion already existed; space flight was really a matter of perfecting theories and then building technology that combined astronomy, combustion, astrophysics and mathematics. It could be argued that Isaac Newton’s discovery of the laws of motion, published in a book in 1687, was the start of rocket science, as this is when people came to understand how much force was required to propel objects forwards. In 1813, a British mathematician named William Moore did calculations describing how an object could produce enough thrust to travel at high speed – effectively becoming a rocket. However, perhaps the real first step into modern rocketry came in 1903, when a Russian named Konstantin Tsiolkovsky calculated that a rocket burning liquid hydrogen and liquid oxygen could, if the thrust was controlled, make an object fast enough to enter space. His work ‘Exploration of Outer Space by Means of Rocket Devices’, alongside several other ideas, resulted in him being called ‘The Father of Modern Astronautics’. In the 1910s and 1920s an American named Robert Goddard moved rocketry further forward, first by conducting mathematics on different types of fuel, and then by building physical rockets. His 1919 book ‘A Method of Reaching Extreme Altitudes’ is seen as an important work in rocket science, and in 1926 he built the first liquid-fuel powered rocket. Over the next 15 years he would test another 33. Germany, meanwhile, began a major programme of rocket building, overseen by the scientist Wernher von Braun and the Nazis. The first space rocket was fired by Germany in 1944. Space flight was still a new idea: it was only 1919 that the technology to send a rocket into space was developed. The first space rocket was a German one in 1944. Yuri Gagarin became the first man in space in 1961. After the end of World War II, the Cold War began and both the USA and USSR saw being the first country to put a man in space as an important victory. ‘The Space Race’, as it was called, was expensive, often secretive, and even controversial, not least that the US had employed several engineers from Nazi Germany, including Wernher von Braun. The Space Race was won by the Soviets when Yuri Gagarin became the first man in space on April 12th 1961. Indeed, the USSR beat the Americans to the first satellite (Sputnik 1, 1957), first man in space (Gagarin, 1961), and first woman in space (Valentina Tereshkova, 1963). The Americans had only one more realistic possibility for a victory: to put someone on the moon. On May 25th 1961, having already lost the race to put a man into space and feeling pressure for problems in Cuba, President John F. Kennedy went to congress and asked for $9bn to send a crew to the moon (and safely return them). The idea was hard, and by September 1963 the Apollo programme was costing so much money that Kennedy, speaking at the UN, proposed cooperation between the US and USSR. It is believed the USSR was going to accept, but Kennedy was assassinated in November of that year. Events in the Soviet Union, however, would come to America’s aid. In 1964 the Soviet President Nikita Khrushchev was overthrown by a coup. In early 1966 the chief engineer of the Soviet space programme, Sergei Korolev (whose identity had been kept secret), died during surgery. Soviet space plans were put on hold. 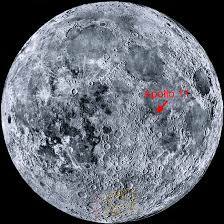 The 11th Apollo mission was designated the one to land on the moon. It had 3 astronauts: Neil Armstrong, Buzz Aldrin, and Michael Collins. All three had been pilots in the US Air Force. On the ground, mission control spoke to them from Houston. Although the Soviet programme had hit problems, it did nearly undermine the US achievement: on July 13th, 3 days before Apollo 11 took off, the USSR had an unmanned craft in lunar orbit. However, it crashed into the moon and was subsequently forgotten in history. On July 16th, helped by the Saturn V rocket, Apollo 11 took off from the Kennedy Space Center, Florida. After 12 minutes it was in Earth’s orbit, at which point another engine fired it towards the moon. On July 19th it reached the moon’s orbit. 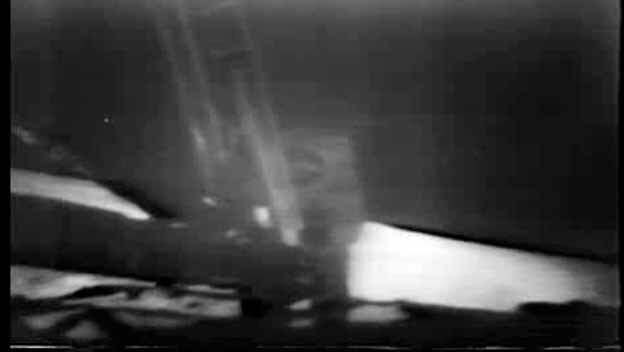 After orbiting the moon several times, the craft separated into two on July 20th: the lunar landing module (‘Eagle’), carrying Armstrong and Aldrin, and the main portion (‘Colombia’) on which Collins remained. The landing module descended towards the Sea of Tranquility, landing at 20:17 UTC. It had been 102 hours since they left Earth. Before landing all three astronauts spoke, saying the mission was not 3 men, the many who had made the technology and idea possible. Then, after landing, Neil Armstrong stepped out of the lunar module and became the first man on the moon. It is estimated 530 million people watched the lunar landing, a huge amount in a time of limited television. It was a seminal moment in the history of live television events. 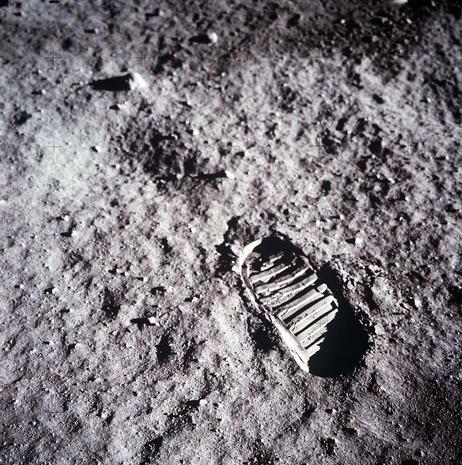 ‘This is one small step for (a) man, one giant leap for mankind.’ (when Armstrong first stepped on the moon). 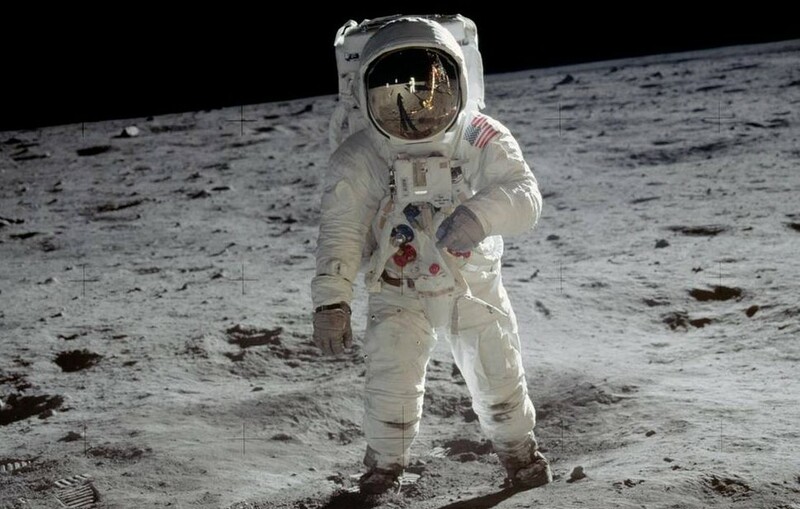 In reality ‘The Eagle has landed’ were not the first words spoken from the moon, as the astronauts had some technical issues to address – the first words were “Contact light. Okay. Engine stop.” However, these words were not on the feed that television viewers heard. Since nobody had ever walked on the moon before, Armstrong and Aldrin tried different styles of walking. They found ‘loping’ the easiest, although ‘bunny hopping’ also worked. During their time on the moon, the two also planted a flag, took some samples, and spoke to President Richard Nixon. After around 2 hours on the moon’s surface, Armstrong and Aldrin returned to the Eagle and rested for 7 hours. They then launched to return to Collins and Colombia. From here they flew back towards Earth, landing in the Pacific Ocean on July 24th. The astronauts were put in quarantine until August 10th (at that time there was no idea whether the moon was safe for humans) and then released. On August 13th they were given parades in New York, Chicago, and Los Angeles. Over the next 45 days, the astronauts visited 25 different countries. Unsurprisingly, all 3 astronauts were granted huge honours. In 2009 they were awarded the Congressional Gold Medal, the highest award an American civilian can be given. – Who filmed Armstrong stepping onto the moon? (this is easily discounted – the lunar module was already on the moon). – The photographs are too good. – There are no stars in the photographs. – Astronauts appear on top of ‘crosshairs’; the crosshairs should appear on top of the astronauts. – The shadows do not appear to be in line with the sun. – There appear to be ‘hotspots’, areas in which a spotlight is shining. – Backgrounds appear to be the same in photos taken miles apart. – One person in Australia said she saw a Coca-Cola bottle roll across the corner of the live footage. There is also a theory that Aldrin, not Armstrong, was the first person to step on the moon. Apollo 11 was the beginning of a series of lunar landings – before the end of 1972, 6 missions had been to the moon. However, with the final achievement in the Space Race done, enthusiasm for manned missions dwindled. Since Apollo 17, trips to space stations have made up the majority of manned missions, and nobody has walked on the moon or any other celestial body outside Earth. Apollo 10 had nicknamed its crafts ‘Charlie Brown’ and ‘Snoopy’ after characters in the Peanuts comic strip. 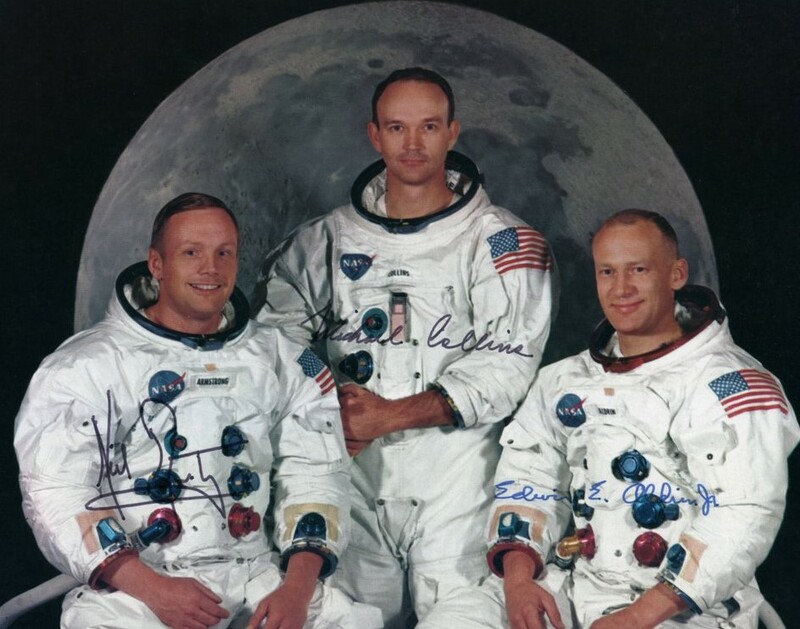 For Apollo 11 it was decided the names should be less ‘flippant’. They chose ‘Columbia’ for the command module (which didn’t land on the moon, but housed the astronauts there and back), and ‘Eagle’ for the landing lunar module. Aldrin accidentally broke an ignition stick inside the lunar module, and it was briefly thought the astronauts would have to rewire a system to lift off the moon. However, a pen did the job, making it one of many examples in which astronauts have found workarounds for issues. Although Collins did not get to walk on the moon, he did design the famous logo of an eagle with an olive branch (although the branch was moved from its mouth to its talons, and the astronauts names were removed because the landing ‘was for everybody’). A hammer was brought to dislodge moon rock, but the only time it was used was to fix something on the craft. President Nixon had planned to make a long phone call with the astronauts but was persuaded to make it short in order to preserve Kennedy’s legacy. The American flag the astronauts planted on the moon fell over when the craft took off. 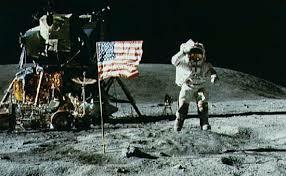 All moon landings afterwards put the flag at least 30m from the craft. The flag on the moon is also now white, as sunlight has removed all the colour.